We are all going to die but fluoridation isn’t killing us. Oh, dear – the local anti-fluoridation people are at it again. More cases of fiddling statistics – and yet again the guilty party is the US anti-fluoridation activist Karen Favazza Spencer. She should really take some advice about statistics. Although I suspect she doesn’t care – she is just once again cherry picking in an attempt to paint a bad picture of community water fluoridation. In this case, she claims the death rates for the leading causes of death in the USA are up to 30% higher in the more fluoridated states than in the less fluoridated ones. And here is her cherry-picked table to “prove it. Her conclusions are wrong, of course. Look at what we find if we use the data for all the states instead of a few selected ones, and look at it for signs of any correlation between fluoridation extent and death rates? The data is readily available. I have done this and found a statistically significant correlation in only one case – cancer. Here is that data and the regression line accounts for about 10% of the variance in cancer rate. Obviously, other factors are involved. But, wait – there is more. As I explained in my last post Anti-fluoridationists exploit infant deaths by fiddling statistics such statistically significant associations often disappear when other important factors are included in the regression analysis. So let’s look at what happens when we include mean state elevation in the statistical analysis. As I explained last time there is an association between fluoridation extent and mean state elevation which means that fluoridation is often acting as a proxy for elevation in statistical analyses. Multiple regressions including both fluoridation extent and mean state elevation picks this up. This table shows the results of such multiple regressions. What does that tell us? Well, the apparent association of cancer death rates with fluoridation is false – it disappears when altitude is included. 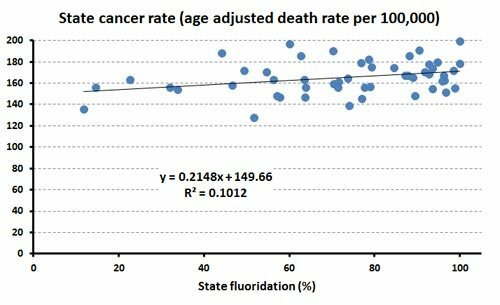 None of the death rates for any of the causes of death had a statistically significant association with fluoridation. But heart disease, cancer, and kidney disease were significantly associated with altitude. These associations accounted for from 16% to 39% of the variances in the death rates. The role of mean state altitude may have something to do with the size of cities or possibly improved health at higher elevations (the death rates declined with elevation for all causes considered). “So, once again the lesson is – never take at face value the claims made by anti-fluoridation activists – no matter how “sciency” their information looks or what data they invoke to “prove” them.